Caffeine-it’s readily available, gives you that much needed morning kick, helps you get through daily tasks and what not. Call it a “perk”, whether you need to get out of bed or prevent yourself from falling asleep at your desk. Most of us require a daily caffeine fix, be it in the form of tea, coffee or a simple energy drink. If used properly, caffeine can help you muster the motivation to never miss a workout, fuel your routine, and boost your metabolism. When used improperly, a caffeine addiction can drag down your energy levels all day, and you’ll end up consuming more calories than you burn. So how much caffeine is too much? Whether you want to wake up, rev up your metabolism or even use it as a pre workout you don’t need to go for size. A small coffee will do as much for you in terms of a mental boost, as a large one. Size & content aside, caffeine affects everyone differently. Listen to your body, and learn from it. Coffee is the second most popular drink in the world, falling just behind water and possibly tea. So is coffee bad for you? Is that morning cup of joe healthy? Just like the perennial controversies about eggs, we have heard much debate about coffee. Having said that, we can all agree on one negative effect: its addictive and the signs of withdrawal are nasty. Universally caffeine is neither good or bad, nor is it healthy or unhealthy. It could be “medicine” to some, “poison” to others. Yes it’s a rich source of antioxidants and bioactive compounds, it promotes athletic performance and may even help prevent cardiovascular disease. However there are certain compounds present in coffee that aren’t tolerated well by some. Caffeine affects different people, you guessed it..DIFFERENTLY. At one end of the spectrum, there are slow metabolisers of caffeine. They don’t process caffeine effectively. They consume it, experience jitters and stay wired even 8 hours after consumption. Even though caffeine has a half life of five hours. Then you have the fast metabolisers, who process caffeine extremely well. They consume it get a short boost and experience mental alertness for a few hours after consumption. Don’t use it as a crutch: For the sole reason that you will build up a tolerance and continue to consume more week after week. If you’re a regular coffee drinker, it will seize to have most of it’s effects on you. Preferably use it only when needed, like when you’re feeling extremely groggy, having a rough day or before a harsh workout. Does coffee make you “fat”? 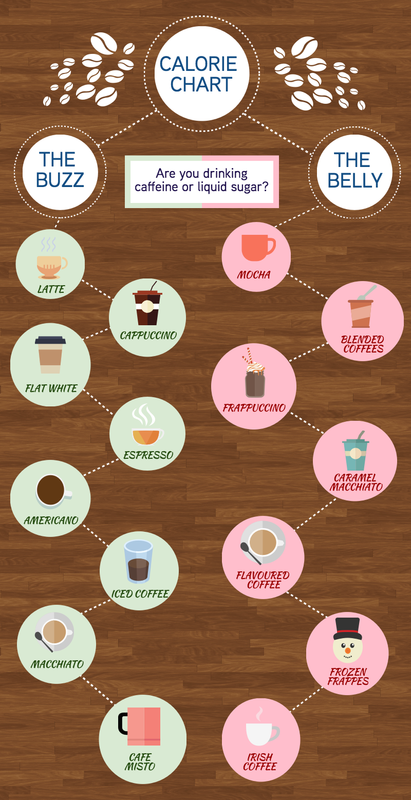 How many calories are there in coffee? Apparently, they give you wings. However in all honesty, most of them contain way too much sugar and chemicals that diminish the very purpose of consuming an energy drink. You’ll feel a quick first, followed by a crash that’s going to leave you feeling lethargic and lazy. 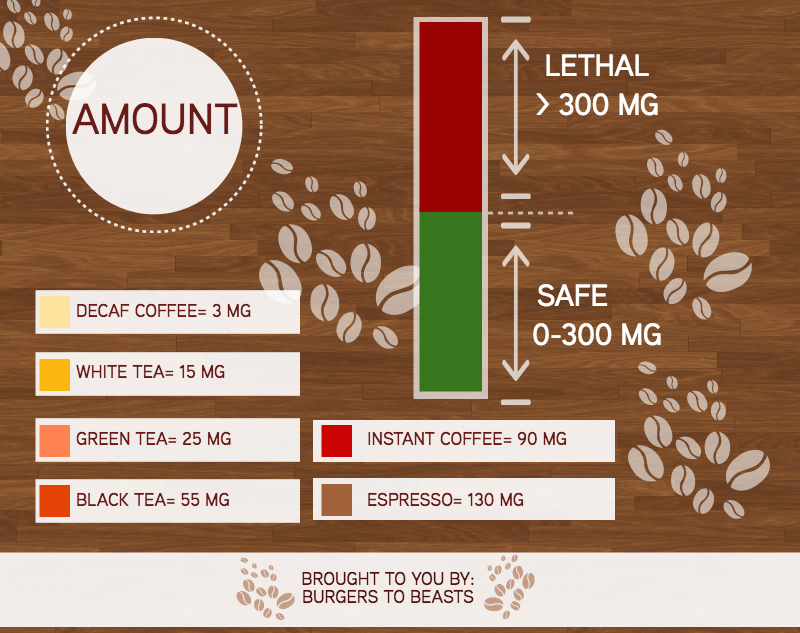 Additionally, most of them contain excessive caffeine, which as mentioned earlier will do you no good. All in all, you’re better off consuming regular coffee/espresso. However if you’re adamant on consuming energy drinks, opt for sugar free versions (WITHOUT ASPARTAME) and by no means mix them with alcohol.